Change the comma after accident to a period. What does it refer to? The town? The volcano? For clarity, change It has to The volcano has. Change which is to which are (because properties is plural). Add a comma after homes. In the last sentence, change was rumored to is rumored (unless the rumor no longer exists). 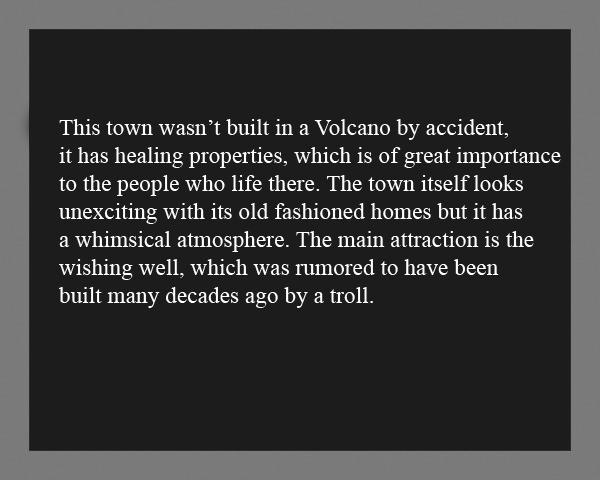 This town wasn’t built in a volcano by accident. The volcano has healing properties, which are of great importance to the people who live there. The town itself looks unexciting with its old-fashioned homes, but it has a whimsical atmosphere. The main attraction is the wishing well, which is rumored to have been built many decades ago by a troll. The words unexciting and whimsical don’t seem quite right, but I cannot ask the writer of the original what they intended, so I can’t say what words would work better to express that. This entry was posted in Writing Glitches and tagged glitch. Bookmark the permalink.